Google FinanceThis looks worse than it is. The Federal Reserve kept interest rates steady on Wednesday and in response the stock market did, well, not much, ultimately finished the day down slightly after nose-diving following the conclusion of Chair Yellen’s press conference. The big movers were Treasuries and gold, both of which rallied. On Wednesday the latest monetary policy statement from the Fed kept interest rates pegged at 0.25%-0.50%, as expected. Along with its policy statement the Fed also released projections for inflation, GDP growth, and a forecast for the future of interest rates. The Fed’s latest “dot plot” showed that all Fed officials expect one more rate hike this year. After that, fortunes diverge for the Fed with one official expecting no more rate hikes while the longer-run expectations for interest rates are now down to around 3% from 4% roughly a year ago. Last week, Neil Dutta at Renaissance Macro said the inclusion of this final sentence would be an indication that the Fed is too hawkish relative to the economic fundamentals. This, in turn, would be a signal to sell stocks. 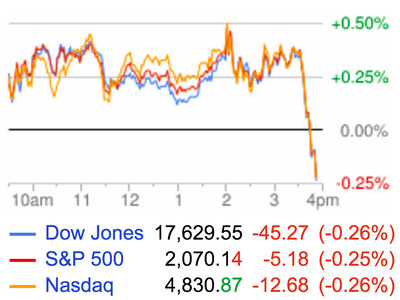 Overall, the market reaction to the Fed’s statement was muted. 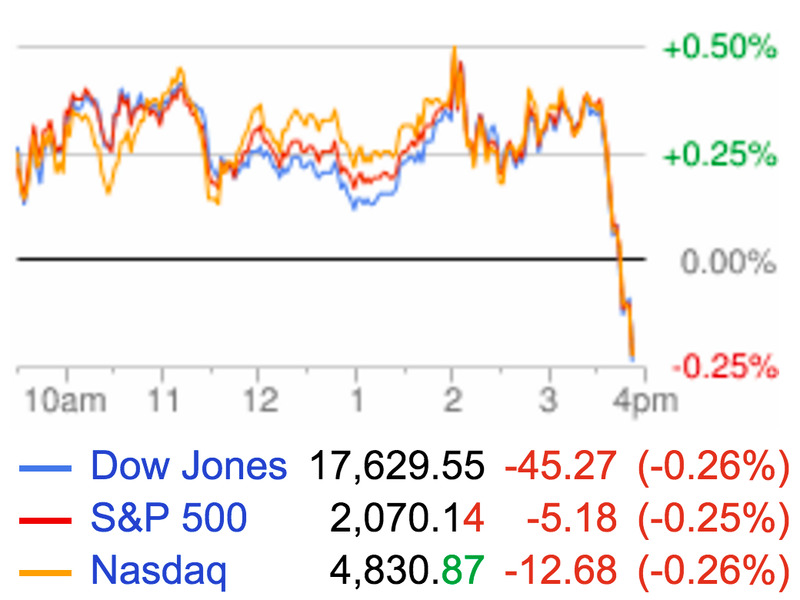 Stocks didn’t do much. Treasuries were bid, gold was stronger. On balance, not a major event. Following the release of the Fed’s statement, Chair Janet Yellen held a roughly hour-long press conference. Yellen emphasised, as she has several times now, that every meeting is a “live” meeting (meaning the Fed could elect to raise interest rates at any of its meetings) and said it is not impossible a policy change could happen at the July meeting. Markets aren’t pricing in any rate hikes through at least February 2017. The chances the Fed cuts rates at future meetings are now up into the 3%-4% range for all upcoming meetings after having fallen to 0% following the release of the minutes from the Fed’s April meeting. During the press conference Yellen said she was surprised at the market’s reaction to these minutes, which were taken as a very hawkish signal from the Fed. Of course, the idea the Fed was going to raise interest rates went out the window with the soft May jobs report we got on June 3, though confidence the Fed was going to act to raise rates in June or July had already been waning. Elsewhere in the press conference, widely-followed Fed watcher Tim Duy, an economist at the University of Oregon, noted that Yellen used the phrase “new normal” two times during the press conference. In economic circles, “new normal” is often a phrase associated with “secular stagnation,” a broad catch-all suggested the economy is experiencing a demand shortfall that will lead to disappointing economic growth for the foreseeable future. Yellen was also asked about the impending “Brexit” vote in the UK, which will see Britons vote to either stay or leave the European Union, and said this event was a factor in the Fed’s decision to keep interest rates on hold. Speaking to the strength of the US economy, Yellen acknowledged that momentum seems to have slowed but demurred when asked to give a time frame on how long the Fed would need to see momentum pick back up for before raising interest rates again. The statement was largely a mark to market affair. The Fed acknowledged the slowing in the labour market but recognised that household spending strengthened. In the second paragraph, the FOMC reiterated its expectation that labour market indicators will strengthen. The language on inflation showed subtle changes in a more dovish direction, in our view. In one line: Convictions crumble, again. The Fed left rates on hold on a unanimous vote. The dotplot shows a median of two hikes this year, unchanged from March, but next year’s median has dipped to three hikes from four. The statement says nothing controversial. The Fed’s communication was more dovish than expected, despite virtually no change in the economic forecasts, implicitly acknowledging increased downside risks (despite no explicit statement on that balance). There was a larger than expected shift down in the 2016 interest rate dots and no hawkish dissent. Six participants now foresee only one hike this year (compared with one participant in March). This suggests a desire for considerably more evidence before the next move. 1. The fed funds rate Dot Plot projections were lowered once again. 2. The median 2016 year-end fed funds rate projection remained at 7/8%, implying two rate hikes, but is three votes away from a 5/8% median and one 2016 rate hike. 3. The 2017 and 2018 median fed funds rate projections were lowered substantially. 5. There were no hints relating to the specific timing of the next rate hike in the normalization process. 7. Esther George did not dissent. Net net the Fed is telling us that the economy is not strong enough for rates to be raised at even a gradual pace. They now look to raise rates only cautiously and gradually. They injected a note of caution today and are less certain of the outlook. It looks like the two month slowdown in payroll jobs has really gotten under their skin. Given them goosebumps such that even the hawks have stopped dissenting for more. The markets are right to ask what does the Fed see that you don’t see. They see a world of increasing risk make no mistake about it. They are more worried than their words can say. Bet on it. The FOMC may aspire to raise rates twice this year, but that’s looking more and more difficult. The Fed still wants to normalize (they would like the fed funds rate closer to the inflation rate), but they have slowed down considerably. There’s a ‘storm brewing’ in the US economy. US companies have bought back a lot of their own stock since the financial crisis. Here’s where investors are putting their money instead of hedge funds. Deutsche Bank’s Amazon logistics fantasy. The top 100 brands for millennials.